• Do you need definitive Electronic Toll Collection (ETC) market data? • Succinct Electronic Toll Collection (ETC) market analysis? In recent years, the global Electronic Toll Collection (ETC) market has undergone growing interest due to increasing need for safe and efficient traffic management, and environmental pollution mitigation. The period 2019-2029 will see a significant upswing in the adoption of Electronic Toll Collection (ETC). 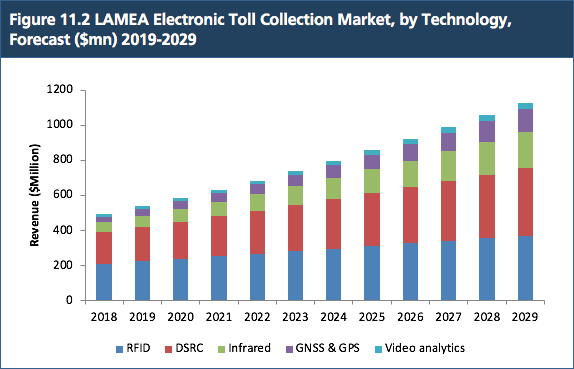 Visiongain values the Electronic Toll Collection (ETC) market at $5.3 Billion in 2019. Violation Enforcement Systems will be one of the fastest growing segments of the Electronic Toll Collection (ETC) market during the forecast period. Electronic Toll Collection (ETC) revenues will increase significantly between 2019 and 2029. This brand new in-depth report on the Electronic Toll Collection (ETC) market describes trends in the market both quantitatively and qualitatively. • How is the Electronic Toll Collection (ETC) Market evolving? • What is driving and restraining the Electronic Toll Collection (ETC) Market dynamics? • How will each Electronic Toll Collection (ETC) submarket segment grow over the forecast period and how much revenue will these submarkets account for in 2029? • How will the market shares for Electronic Toll Collection (ETC) submarket develop from 2019-2029? • What will be the main driver for the overall market from 2019-2029? • How will political and regulatory factors influence the regional and national markets and submarkets?